Julius Cesar’s last act was not to heed the warnings of his impending assassination that was prophesied by a seer, and you know how that story ended. About the subject line FOF. You know how we tax people like our acronyms. IRS, OIC, IA, PPIA, IRM, IRC and on and on it goes. Now I have another one: FOF… What is FOF? It is Fear of Filing!!! a) The penalty for late filing is 5% per month (capped at 25%) where the penalty for late paying is ½% per month and can go down to ¼% if you have the IRS take the money as an ACH. Could be a huge saving if you file on time. b) The IRS will not go away. They have all your information returns (1099s, W2s, etc.) in their systems. They will, after a time, file a return for you, called a Substitute for Return or SFR (of course there are those initials for that). What this means is that the IRS will compute a return and if your last return was as a joint filer, they will prepare it as married filing separately (MFS, there I go again), generally the most expensive way to file in terms of tax dollars. They will not allow for any exemptions for your children or other dependents, or itemized deductions except the standard (no mortgage interest, no taxes, no charitable donations, etc.). If you are self-employed and have 1099s, they will not allow for any expenses. And no credits, like the education or earned income tax credits (AOC or EITC, I just can’t help myself). OUCH! You can prepare an original return, but you won’t know to do that until after the notices start coming. c) If you owe more than $10,000, a lien is automatically placed against your social security number (SSN, LOL) and you will not know about the lien unless you check your credit report. The IRS will not send a notice; it is called a “Silent Lien.” Double OUCH!! d) Then if you ignore the lien, you will receive a Notice of Federal Tax Lien (NFTL, last one I promise!). That is when the “fun” really starts! Triple Ouch!!! It is best to file and file on time. Then you can explore your alternatives as to how to pay what you owe. In my new book, “Now What? I Got a Tax Notice from the IRS. Help!”, I talk about this in easy to understand language. I do not recommend dealing with the IRS on your own. They are the world’s largest and most aggressive collection agency. Their customer service representatives do not consider you their customer, even if they sound nice on the phone. They work for the Service, remember that. Make sure that you have experienced representation when dealing with IRS collections. A tax preparer may do a great job with a tax return, but may not be qualified to handle or have the ability to perform representation services. 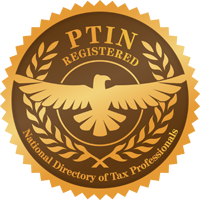 I am an Enrolled Agent and Certified Tax Resolution Specialist (EA or CTRS, respectively – so I fibbed about the NFTL being the last one). However, I can.